Aim: The endodontic literature reports considerable variations in the root canal morphology of mandibular first premolars, including variations in number of roots and root canals. Additionally C-shaped canal configuration has also been documented in some case reports. Thus, the aim of this study was to determine the incidence of C-shaped canal morphology in mandibular first premolars in an Indian population. Materials and Methodology: A total of 110 human mandibular left and right first premolars were collected. All teeth were subjected to CBCT exposures, made with the unit operating in continuous mode at 80 kV and 12 mA with an exposure time of 12s. CBCT images were analyzed using CS 3D Imaging Software 3.1 in the oblique cut. Result: Out of 110 teeth, five teeth (4.54%) presented with the C-shaped canal configuration. Conclusion: Limitations inherent in 2D imaging can be overcome by newer imaging techniques such as CBCT to better appreciate the variations in root canal anatomy. Often quoted as an “enigma to the endodontists,” mandibular first premolar is known for its varying root canal morphology. Thorough knowledge of root canal anatomy and its variations is of paramount importance in the successful outcome of endodontic treatment. Early studies conducted to determine root canal morphology of mandibular first premolar report a high incidence of the monoradicular pattern.,,, Case reports in the recent endodontic literature based on ethnic background or geographical population analysis have concluded that this tooth can present itself with one root, two roots, and even three or more roots (“Ridiculous premolar.! !”).,, Apart from having multiple roots and root canals, C-shaped canal configuration has also been documented in mandibular first premolars., The significance of identifying a C-shaped canal lies in the fact that this complex canal configuration is difficult to clean, shape, and obturate. Many in vitro and in vivo studies have been conducted to determine the incidence of C-shaped canals in mandibular first premolars using various methods.,,,, Studies conducted to determine the root canal anatomy are usually conducted by radiographic examination, grinding and examination under magnification, staining, clearing method, sectioning technique, cone-beam computed tomography (CBCT), and Micro-CT. The pitfalls present in conventional radiography are the problems of anatomic noise, and moreover, it is a two-dimensional (2D) reproduction of a 3D object. The objective of this article is to determine the incidence of C-shaped canals in mandibular first premolars in the Indian population using CBCT. A total of 110 human mandibular left and right first premolars, previously extracted due to orthodontic reasons or severe periodontal disease were collected from different dental hospitals and clinics of North India. Fully erupted teeth with complete root formation were selected for the study. Endodontically treated teeth, teeth with deep caries, restorations, fractures, and crowns were excluded from the study. Teeth were cleaned off the attached soft tissue, debris, and calculus using an ultrasonic scaler (Suprasson® P5-Satelec, France) following which the teeth were kept in 5.25% NaOCl (Novodent Equipments and Materials Ltd., Mumbai, Maharashtra, India) for 15 min. For image acquisition, CS 9300 3D digital imaging system (Carestream Dental, Atlanta, Georgia, USA) was used. All CBCT exposures were made with the unit operating in continuous mode at 80 kV and 12 mA with an exposure time of 12 s. The unit was operated by a licensed radiologist. CBCT images were analyzed using CS 3D Imaging Software 3.1 (Carestream Dental, Atlanta, Georgia, USA) in the oblique cut. A slice thickness of 0.5 mm was obtained for the specimens, and the reconstructed images had a resolution of 512 × 512 × 512 voxels. Only CBCT images of good diagnostic quality with field of view in which mandibular second premolars could be best visualized were retained for the study. Images were analyzed independently by two radiologists with at least 2-year experience and in case a common consensus could not be reached, an endodontist was also consulted. Of 110 teeth, five teeth (4.54%) presented with the C-shaped canal configuration. According to Fan's classification, Category I (C1) was present in three teeth (specimens 2, 4, and 5) and Category II was present in two teeth (Specimens 1 and 3) [Figure 1] and [Figure 2]. Slowey stated that mandibular premolars present extreme variations in their root canal morphology and possibly are the most difficult teeth to treat. The anatomic oddities encountered in mandibular first premolars as reported in the endodontic literature are as follows: two or three canals in one root or two roots; three roots and three canals; and four canals in four roots. Lu et al. have coined the term “circumferential canals” for a distinctive canal configuration found in 6% of mandibular first premolars. Failure to recognize the complex anatomy found in mandibular premolars could result in treatment failure, and hence, it is imperative for the clinician to have a comprehensive knowledge of the root canal anatomy. 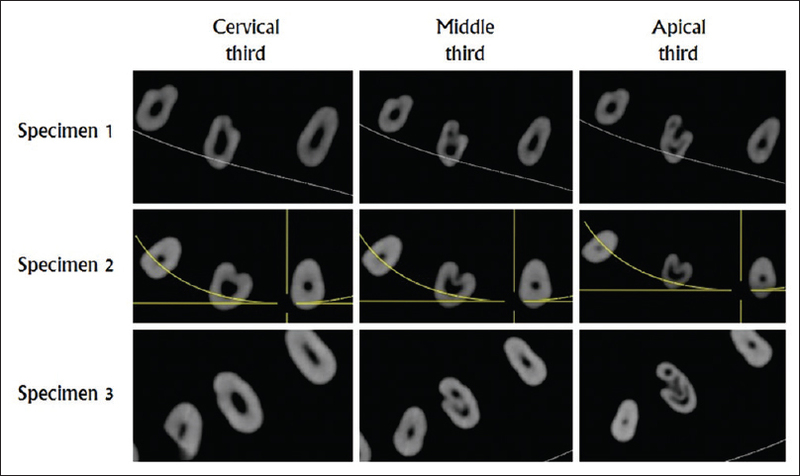 The incidence of C-shaped configuration in this study was found to be lower than the study conducted by Sikri and Sikri who reported that the incidence of C-shaped canals in mandibular first premolars was 10.7% (n = 112). In a South-Indian population, Sandhya et al. reported an incidence of 2% C-shaped canals in mandibular first premolars. 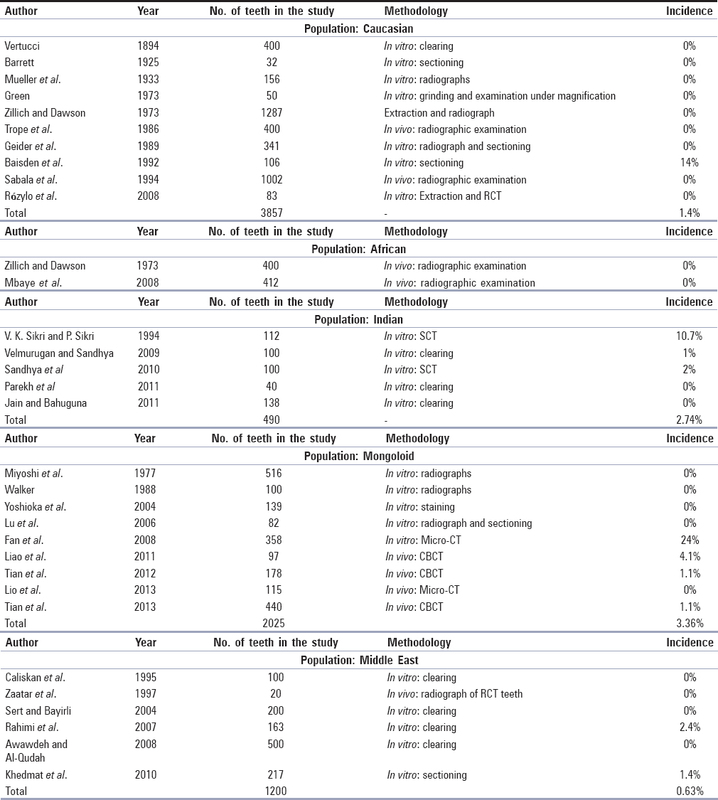 [Table 1] illustrates the findings of various anatomic studies based on geographical population. Although C-shaped canal configuration has mainly been documented in mandibular second molars, it has been reported in mandibular second premolars (1%), mandibular third molars (3.5%–4%), maxillary first molars (0.12%), maxillary third molars, and even palatal root of a maxillary second molar. The C-shaped configuration in mandibular second molars is generally found in the coronal 3 mm below the cementoenamel junction. The position of the “C” in mandibular first premolars was found to be a little different in this study [Figure 1] and [Figure 2]. The location of the C-shaped canal was found only at the apical size of 6–7 mm. Coronally, either one single oval canal or two canals were present. This finding is in agreement with Khedmat et al. who found C-shaped configuration in middle and apical thirds and oval canals in coronal thirds. Hence, the recognition of C-shaped canals is challenging in mandibular first premolars as compared to mandibular second molars. Various methods have been employed to study the root canal space. Methods such as sectioning, grinding, clearing technique, or dye penetration are invasive and preclude further use of the specimens. Radiographic methods on the other hand are noninvasive, easy to perform, less time-consuming, and more feasible (especially in in vivo situations). Conventional radiography has obvious disadvantages of anatomic noise and the fact that it is a 2D representation of a 3D object. Hence, we conducted this study using CBCT. In addition to CBCT, other diagnostic aids such as 3D micro-computed tomography (μCT) reconstruction have been used by Cleghorn et al. who reported a case of mandibular first premolar with three roots and a second premolar with C-shaped canal system. 3D reconstruction provides an exceptional view of internal as well as the external morphology of teeth. 3D micro-CT could be a vital research tool for the future studies. The main drawback of these newer techniques including CBCT is that they require special software and personnel with advanced training to interpret the results which, in turn, make these techniques expensive. Clinical significance of recognizing a C-shaped canal system is its chemomechanical debridement which is an arduous task. Access cavity under dental operating microscope (DOM), advanced irrigation systems such as Endovac and/or US agitation and thermoplasticized obturation systems can result in successful endodontic treatment when such a complex root canal system is encountered. The evidence is compelling that the limitations inherent in 2D imaging can be overcome by newer imaging techniques such as CBCT. Many in vitro and in vivo studies have shown the superiority of CBCT over conventional imaging. A single-rooted tooth with a single tapering canal, one orifice, and one apical foramen is more of an exception rather than a rule. Blind endodontics, solely based on the endodontist's skill and knowledge is a thing of past. The future of endodontics lies in using DOM, advanced irrigation systems for thorough debridement of the root canal system, and newer techniques such as CBCT and micro-CT, in addition, to conventional radiography to better appreciate the root canal system anatomy. Kottoor J, Albuquerque D, Velmurugan N, Kuruvilla J. Root anatomy and root canal configuration of human permanent mandibular premolars: A systematic review. Anat Res Int 2013;2013:254250. Barrett M. The internal anatomy of the teeth with special reference to the pulp and its branches. Dent Cosmos 1925;67:581-92. Schulze C. Developmental abnormalities of teeth and jaws. In: Gorlin R, Goldman H, editors. Thoma′s Oral Pathology. 6th ed. St Louis: CV Mosby Co.; 1970. p. 106-7. Geider P, Perrin C, Fontaine M. Endodontic anatomy of lower premolars – A propos of 669 cases. J Odontol Conserv 1989 Winter,(10):11-15. Shenoy A, Bolla N, Vemuri S, Kurian J. Endodontic retreatment – Unusual anatomy of a maxillary second and Mandibular first premolar: Report of two cases. Indian J Dent Res 2013;24:123-7. Vaghela DJ, Sinha AA. Endodontic management of four rooted Mandibular first premolar. J Conserv Dent 2013;16:87-9. Cleghorn BM, Christie WH, Dong CC. Anomalous mandibular premolars: A Mandibular first premolar with three roots and a mandibular second premolar with a C-shaped canal system. Int Endod J 2008;41:1005-14. Baisden MK, Kulild JC, Weller RN. Root canal configuration of the mandibular first premolar. J Endod 1992;18:505-8. Sikri VK, Sikri P. Mandibular premolars: Aberrations in pulp space morphology. Indian J Dent Res 1994;5:9-14. Sandhya R, Velmurugan N, Kandaswamy D. Assessment of root canal morphology of mandibular first premolars in the Indian population using spiral computed tomography: An in vitro study. Indian J Dent Res 2010;21:169-73. Velmurugan N, Sandhya R. Root canal morphology of mandibular first premolars in an Indian population: A laboratory study. Int Endod J 2009;42:54-8. Lu TY, Yang SF, Pai SF. Complicated root canal morphology of mandibular first premolar in a Chinese population using the cross section method. J Endod 2006;32:932-6. Slowey RR. Root canal anatomy. Road map to successful endodontics. Dent Clin North Am 1979;23:555-73. Nallapati S. Three canal mandibular first and second premolars: A treatment approach. J Endod 2005;31:474-6. Liao Q, Han JL, Xu X. Analysis of canal morphology of mandibular first premolar. Shanghai Kou Qiang Yi Xue 2011;20:517-21. Yang H, Tian C, Li G, Yang L, Han X, Wang Y, et al. Acone-beam computed tomography study of the root canal morphology of mandibular first premolars and the location of root canal orifices and apical foramina in a Chinese subpopulation. J Endod 2013;39:435-8. Fernandes M, de Ataide I, Wagle R. C-shaped root canal configuration: A review of literature. J Conserv Dent 2014;17:312-9. Yu X, Guo B, Li KZ, Zhang R, Tian YY, Wang H, et al. Cone-beam computed tomography study of root and canal morphology of mandibular premolars in a Western Chinese population. BMC Med Imaging 2012;12:18. Kuzekanani M, Haghani J, Nosrati H. Root and canal morphology of mandibular third molars in an Iranian population. J Dent Res Dent Clin Dent Prospects 2012;6:85-8. Cleghorn BM, Christie WH, Dong CC. Root and root canal morphology of the human permanent maxillary first molar: A literature review. J Endod 2006;32:813-21. Sidow SJ, West LA, Liewehr FR, Loushine RJ. Root canal morphology of human maxillary and mandibular third molars. J Endod 2000;26:675-8. Singla M, Aggarwal V. C-shaped palatal canal in maxillary second molar mimicking two palatal canals diagnosed with the aid of spiral computerized tomography. Oral Surg Oral Med Oral Pathol Oral Radiol Endod 2010;109:e92-5. Khedmat S, Assadian H, Saravani AA. Root canal morphology of the mandibular first premolars in an Iranian population using cross-sections and radiography. J Endod 2010;36:214-7.